Company: Can be kept with other species with the same temperament. Aquarium setup: Keep .one male to 5 females. Overstocking the aquarium may help to suppress the worst aggression. Requires stone formations that allow the fish good hiding places (one per fish) and free areas to swim on. Don’t use roots in your aquarium since they lower PH levels. Feeding: Accepts all kinds, however the bulk of their diet should consist of vegetables. Breeding: Mouth-brooder. The species may become very aggressive while spawning. 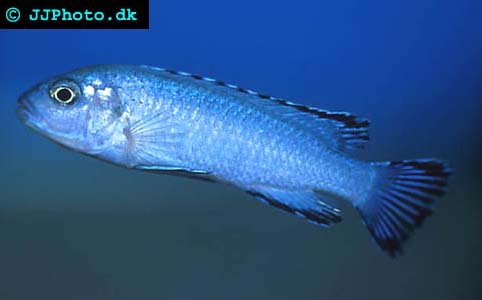 The female will brood for approximately 3 weeks and gives birth too up too 60 fry. You can tell if a female is brooding by her enlarged mouth and the fact that she isn’t eating. The female cares for the fry 2 weeks after they first leave her mouth. Fry accepts most kinds of food. Brooding females can be isolated for more productive breeding. It is recommendable to try to make the isolation as short as possible to avoid that the females loses their social status which may cause fights once they are returned. Stress might cause the females to eat eggs and fry. Some fry may survive in a community tank.